AS many of you know, Reference Recordings has been releasing HiRez files of some of their titles. They are about 3-4GB in size, and produced as wav files. That means they are about eight times the size of the typical CD. Reference sells them burned onto DVD's with no DRM encoding. You cannot play them directly (although I heard this weekend that there is a new device that can play them). You download the files to a hard drive and then send them to a DAC that can decode the 176/24 that they are recorded at. So far there are nine titles, including two which are the same as the TP series 1: the Arnold Overtures (TP-003) and the Exotic Dances (TP-007). I have done some extensive comparisons between my TP copy and the HRx file of Exotic Dances, which, like the TP tape, was derived from the orignal analogue master. That was also true of the Arnold Overtures. All the other RR releases so far have been from more recent issues which had no analogue master. 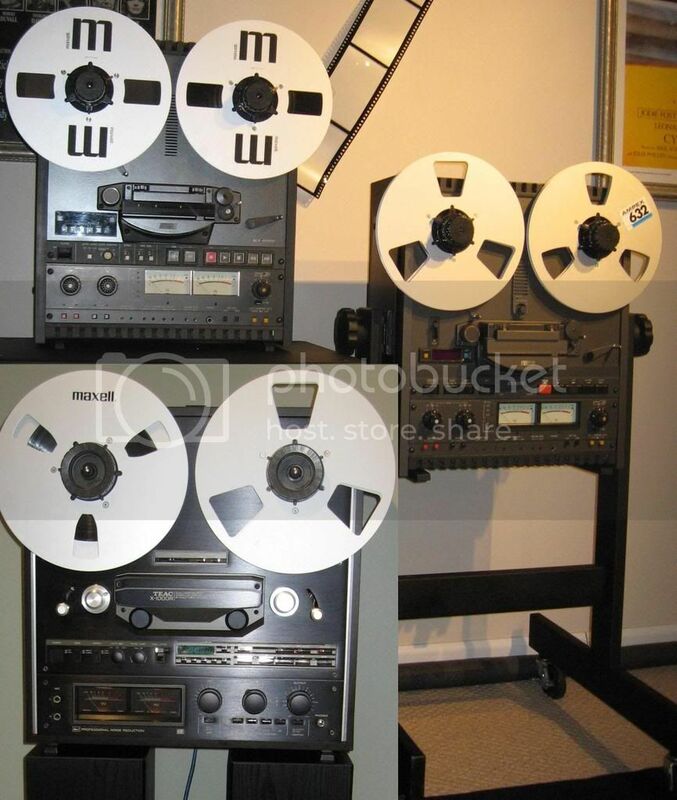 Those are bit perfect copies of the master files from those recordings. (Much of this detail comes from a discussion I had on Sunday with Marcia Martin, the VP of Reference Recordings, who was at the Computer Audiophile Symposium along with Paul, Dan and Romo as well as Steve 'oneobgyn" Williams. Now for the comparison. First, both are superior in sound to resceptively vinyl and CD. I would be very happy with either one, and would not know the difference without hearing them side by side. However, there are real differences. First, the tape is more spacious, has more air, particularly with solo instruments. Listen to the first section of the Dance of the Seven Veils - the second track. When the music quiets down, there are some solos first in the strings - I think it is a viola, and then woodwind. The sense of acoustical space is palpable and wonderful. There is not as much of this in the HRx recording. I played part of the tape vs. HRx at Steve Williams home on Saturday and one of the guests said the tape sounded "fresher." On the HRx file, the very deepest bass was much stronger than on the tape. This was true in both my system and in Steve's. We both run subs along with our main speakers which are run full range. This gives us both bass cleanly to 20Hz. My system without the sub goes down to about 35Hz (Avantgarde Duo's) and my sub (Velodyne DD-18) takes it down to 20Hz. Steve's system goes even deeper with a pair of JL Gotham subs running with WIlson Alexandria X-2's. The bass is more felt than heard. If you have a system that only goes to 35 Hz or so, then you won't notice the difference. For the HRx, I am using a system that was built patterned after Joel K's system that he describes in the Computer Audiophile Forum. It is based on an EMU 0404 USD DAC. This is a really great HiRez system for a bargain price. The other advantage that the HRx file has, is that Exotic Dances has three more cuts than the TP tape - the same as the CD. The Arnold has exactly the same content though in a different sequence. I haven't done a detailed comparison with the Arnold Overtures yet, I just got that from HRx. Joel has, and he may want to also comment. In any case, I am very happy that I have both. The HRx files are going to be focused on modern recordings, while the TP tapes are going be focused on the classic recordings from the 50's, 60's and 70's, with a few recent recordings from the end of the analogue era. Your post led me to researching the EMU 0404 USD DAC. WOW, less than $200 24/192 over USB and great reviews. Looks like the ticket to taste High Rez and to start building a library while Bottlehead comes out with their own DAC. I wonder if my Apple Powerbook USBs are 2.0? Xavier, if you want to use your Macbook, get a firewire interface. I can handle anything they might come up with in the foreseeable future. From a quick glance at what's currently out there, the M-Audio Profire 610 seems like a real bargain for just over $300 (firewire is always more expensive). You can find them used on eBay for closer to $200 but I wouldn't risk it for a little over $100 bucks. I have an M-Audio USB 24/96 that I've had for about 8 years and I've been pretty happy with it (it was about $120) and I still use it for an extra interface. I think the only complaints I have is that the drivers used to be a little glitchy but it seems like they've gotten their act together since then. Well, I finally got around to comparing my HRx Exotic to the TP tape version today. It's really amazing as I had not looked at your specific comments until after I had taken my notes between the two. My conclusion is almost EXACTLY what you had written, even with some of the exact audio jargon! The tape is: "smoother, silkier, warmer with greater texture in the mids, greater airiness on top with a more extended treble, soundstage is more open with greater depth". The HRx is: "thinner harmonically in the mids with less palpability, there is a slight "glassiness/glareiness/hardness" to the sound that is not on the tape at all, deep bass is more pronounced and extended, sound hangs more around the physical space of the loudspeakers(less expansive)"
Bottom line is that I agree with you 100% that BOTH versions are sonic stunners. If I did not have the TP tape, I would have never known ANY of the deficiencies listed above even existed on the HRx version!